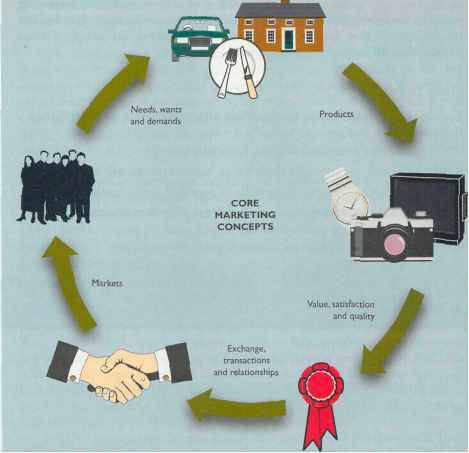 Open any marketing textbook and you are likely to read about the classic Four Ps marketing model, which advocates using a mix of product, place, price, and promotion to create customer demand. For decades, marketers have used the Four Ps to decide where they should sell products, at what price, and whether to include buyer incentives. Today, the Four Ps are no longer enough to penetrate the fog of information about products and services. The guerrilla extends marketing to six more principles. Modern marketers are busy plastering every available inch of our world with their messages. Bathroom stalls, grocery store floors, and even bunches of bananas are now advertising spaces. Consumers are weary of the onslaught and tune it out. The rising popularity of digital video recorders that let you zap out television commercials proves the point. Clients and prospects have zero tolerance for marketing fluff, but a deep thirst for ideas that can help them. Selling services is not just about price, qualifications, or your firm's long string of success stories. First and foremost, it is about the insights and ideas you bring to clients. If you can't provide great ideas, you might as well stay home. Clients also ignore jargon-rich and content-free messages. They have become desensitized to such messages and skeptical about whether they reflect reality. Your insights into an industry, a discipline, or a specific company should be the fuel for your guerrilla marketing plan. Your qualifications may get you that first client meeting, but the ideas you propose will be your strongest selling points. Consultants are often hesitant to disclose their best insights in their marketing materials. However, insights are the guerrilla's ultimate weapon. They cut through the marketing morass. Frame your marketing to help clients resolve urgent, substantive issues. Give them original, insightful, and valuable ideas at every step of the marketing process. Guerrillas employ a wide assortment of marketing tactics to send cohesive messages to targeted clients. They use their Web sites, newsletters or zines, speeches, research and survey reports, presentation materials, proposals, endorsements, testimonials, references, and even their letterhead and business cards. Unless your marketing strategy is well integrated and all elements are coordinated with each other and your overall plan, they won't get the job done. Each of your marketing approaches must support, reinforce, and cross-promote the others. Your goal is to imprint multiple, positive impressions on clients in your target markets. The right mix of marketing tactics working in unison will create an overall market impact that is more potent than the sum of its parts. Reference your articles and Web site in your proposals and your research in direct mail and speeches. Design your business card and Yellow Pages ad to promote special features of your practice. If your firm specializes in improving warehouse workers' productivity, highlight that fact; or if strengthening employee attitudes is your forte, showcase it in all your market communications. Clients equate success and competence with sustained presence, so blanket your targeted industry. For a cumulative effect, hit your target markets simultaneously on many fronts. When clients repeatedly see your articles, read about your speeches, and see the results of your research, they will accept you as an expert and fight to hire you. Relationships are the lifeblood of a consulting practice. Most consultants spend considerable time in contact with clients but fail to build enduring client relationships. Forging long-term relationships can take months or even years. Guerrillas invest in building those relationships as the core of their marketing strategy. Strong relationships are essential to successful marketing; they provide the path of least resistance to profits. When you invest in your existing client relationships, your marketing efforts will yield higher dividends and generate larger and more frequent projects with your current clients and their networks. Try to produce 60 percent of your new business from current clients or referrals from current clients. They will provide you with more business with less effort at a lower cost. A superb performance record and strong relationships will have a multiplier effect on your marketing efforts. They will position you at the head of the pack for new consulting projects. You will be invited to work on projects before your competitors even hear about them, and you will receive recommendations for other highly prized assignments. A strong client relationship can be a two-edged sword. The benefits can be enormous, but clients may demand more from you as their expectations grow along with the relationship. It is a paradox of consulting that it can be harder to sell to existing clients than to new ones. supplier-customer relationship that focuses solely on getting more for less. Those relationships are seldom worth your effort. Also build supportive nonclient relationships. A public relations consultant may need to join forces with a freelance copywriter to properly serve a client; a technology consultant may need a computer programmer to sort out thorny technical issues. To meet client needs, rely on a cadre of trusted associates who can fill in project gaps. Nonclient relationships with colleagues, suppliers, past clients, and even your competitors can provide a competitive advantage. Tteat them with the same care as clients . . . plus, they may become clients or refer business to you. Rely on technology. It can provide untapped opportunities to bring new dimensions to your business. Use low-cost software to produce targeted communications for clients, instead of tired old boilerplate that clients routinely pitch in the trash. Stay on top of virtually every detail of your industry, clients, and competitors for just pennies a day. Package and repackage your speeches, research, books, and articles. Publish and sell them through Internet channels to earn money while you sleep. Create personal connections with clients and prospects. With a few keystrokes, reach out to your prospects, clients, and network with up-to-the-minute information and ideas that encourage dialogues. Use e-mail and your Web site to give clients and prospects a resource that will help them solve problems and establish you as an expert. Technology should supplement, not replace, personal contact with your clients and prospects. Guerrilla clients expect every consultant to be technologically advanced. Clients don't want yesterday, they want tomorrow; and technology is the gateway to tomorrow. Tip the competitive scales in your favor by integrating powerful, low-cost technology into every aspect of your practice, from gathering business intelligence to marketing, billing, and revenue generation. Use technology to manage and simplify your practice, strengthen client relationships, reduce reliance on high-priced specialists, and promote your practice, guerrilla style. It is not true that any revenue is good revenue. The guerrilla measure of success is not how much money you make, but how much you keep. A long-term, high-fee project that isn't profitable can lock you into a ruinous financial downspin. Keep a handle on all operating costs and make pricing decisions that will yield high profits down the road. Walk away from projects that can't meet your profitability goals, no matter how large the fee. For decades, Hong Kong's Jimmy Chen's Custom Tailors have delighted customers with finely tailored, custom clothing, despite overwhelming competition from lower priced options. In Jimmy Chen's shop, one size fits none. Each customer order begins with the basics, but after a series of careful fittings, every garment is shaped to fit the customer's precise dimensions and to meet demands for high-quality materials and workmanship. Tailor your marketing as if you were crafting a custom suit. Start with the basics—a vision for the business, your value proposition, and the markets you will pursue—and then shape the details. Meet the precise needs of your clients and the market. Strike a balance between building on your existing business and attracting new clients. Adjust this balance as your practice matures. Your marketing plan doesn't have to be a book-length volume brimming with colorful charts and graphs. Your plan should be comprehensive, but simple enough to be clear to your colleagues, clients, and suppliers. Begin with a few well-crafted sentences. Once you sift through your options and make critical marketing decisions, identify and launch the guerrilla marketing weapons that will move your practice in the desired direction. After you get started, you can broaden your plan or embellish it with analyses, charts, and appendixes.